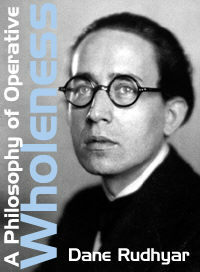 Part Five of the series A Philosophy of Operative Wholeness treats some of the mysteries of form, number and proportion. In the closing paragraphs, Rudhyar coins yet another neologism: Cosmosophy. Now it becomes clear that in this series Rudhyar is attempting to give a modern, philosophical foundation to the core principles and concepts of theosophy, and attempting to give it a more appropriate name. In the final paragraph Rudhyar mentions Pythagoras, 6th Century B.C. Sage whose legacy had a profound influence on Rudhyar during his early years. Indeed, as a young man Rudhyar kept a picture of Pythagoras in his room, and throughout his adult life Rudhyar kept pictures of the Masters (or Mahatmas) of H. P. Blavatsky at his bedside. A cosmos is an operating whole. It is an organism in space and a cycle in time. It is a fulness of life. Out of this fulness is distilled, or emanates, the quintessence of being, which is God. God is the flowering of cosmos, and this flowering is eternal, because the universal form of life is changeless and always complete. For whomever can see whole and becomes one with space and destiny, there is only one eternal cosmos; because there is only one universal form of life, and only one God. This eternal form of perfection is the sphere. All other forms either evolve toward the sphere or are degenerations thereof. All consciousness likewise either evolve through Man toward the God-realization, or fall away from this apex of perpetual Becoming. Within this universal sphere whirlpools of cosmic substance occur, which we call universes. These do not disturb the changlessness of the sphere. It is just as much sphere and wholeness with or without the internal eddies; for any whirling to the left is neutralized, or harmonized, in time and space, by a whirling of the same nature to the right. Thus eternal Harmony reigns. The essence of this Harmony is God. These internal eddies, which constantly occur or "dis-occur" (in terms of time), appear or disappear (in terms of space) – these windings and unwindings of cosmic substance-energy – tend always to assume the form of perfection, and to become wholes. The purpose of their appearance is to integrate more fully cosmic elements which are inherently separate in nature and bring them to the realization of wholeness, of harmony, of God. This purpose exists only as such in the realm of time. Eternity is necessarily purposeless. It merely IS. In the realm of time, we must therefore postulate many solar systems or galaxies within the Universal Form which is a transcendental and noumenal Form, but also which finds itself anew constantly as it is reproduced in these worlds that reach the stage of perfected equilibrium, of spherical manifestation, and becomes thus images, or sons, of the cosmos. It is seen that in these comsoi the perfect proportion Pi (relation of circumference to diameter) has reached complete control over the separative and individualistic tendencies of all substantial elements, or atoms, contained within the cosmic boundaries. The Law is obeyed by all. It is the law of circularity, the expression of which Pi (3.141591 . . .), an irrational – that is, never completed – number. Pi is thus the law of operating wholeness, the one cosmic law. Many great truths can be discovered by studying this number. The following few can be mentioned in a brief article: Pi shows that the circumference is greater than three diameters, or six radii, or rays of emanation from the center, are necessary to a form which will encompass a mass of cosmic substance such that all its component units may be related as parts within a whole. Six rays are not enough. Something more is needed, an irrational, unending effort, which is the mysterious reality of the 7th Ray, which contains in itself all numbers in a peculiar order. The order of the decimals in Pi has not apparently been interpreted publicly in modern times, though The Secret Doctrine gives some geometrical hints difficult to follow. It may be valuable to note that the first decimal is 1; that wherever the number 1 appears, a new cycle opens, etc. Six radii are not sufficient to measure the circumference, but six tangential circles of the same size as a central one makes a continuous belt around the latter. This means that in any circle seven smaller tangential circles can be inscribed. In a sphere, thirteen smaller spheres likewise can be built; twelve around a central one, all the same size. The radius of the enclosing circle or sphere is three times that of the enclosing ones. which equals the area of two inner circles. In other words, if you inscribe within a circle seven small equal and tangential circles, you divide the area of the former into nine parts. Seven parts make the total area of the seven inner circles; two parts make the total area of the twelve spaces between these seven circles. This gives us the geometrical basis of for an understanding of the relation of 7 (spiritual because formed of life) to 2 (material because unformed, un-circled life), spirit to matter. Both spirit and matter are encompassed by the larger circumferences; both are parts of the eternal Forms of the one Cosmos, functions in the Wholeness. Spirit is that which has reached organic formation, or circlehood. Matter is that which must always be left out of the circles; yet which is within the one Circle of Wholeness. Man is the little circle; seven types of them, seven Rays. God is the all-encompassing Circle, ever the same, eternal. Man must keep changing, for the substance within the universal Circle must be alternately part of Man, and outside of man. Thus the permutation of Rays; thus the idea of reincarnation (a partial, because temporal, idea) of manvantaras and pralayas. For Whom knows himself as wholeness and does not exclude the outside and outcaste, there is no reincarnation; there is instead permanent form of self; that is, soul immortality. All types of men are, in a sense, equal and similar. But there are two types of matter, inner and outer. The number 2 is divided into six large outer fractional units, and six small inner fractional units; body and soul, in a sense – outer and inner vehicles. The relative areas and the form of these outer and inner fractional units are also most significant. Also the division of the circle into twelve segments by diameters, which follows naturally from such a figure, will present itself with a new meaning. This division is that used in astrology charts. On the plane of noumenal perfection or ideation, a cosmos presents itself so divided. On the plane of archetypes and individualization, we deal with spheres. There the encompassing sphere is divided into 27 units of volume (to be related to the 27 lunar asterisms of Hindu astrology) 13 units make up the total volume of the 13 enclosed spheres (the apostolic brotherhood of 12 and Jesus in the center), and 14 units the total volume of the spaces between the enclosed spheres. There the unformed and unregenerated predominate over the formed and spherically integrated. These few points represent basic facts in the philosophy of operative wholeness, which is as well the science of cosmic organization and the art of life-harmonization; which is also the religion of order and of the Mystery. We might bring all these under one heading: Cosmosophy. Cosmosophy is not abstract speculation. It is a philosophy, a science, and art of living relationship. It is the religion of wholeness in a though action and destiny. The great teacher of cosmosophy for the West has been and remains Phythagoras. Usually "cosmos" leads to "theos", and "theos" to TAO. However there are men who, through perfection of action and understanding, soar from the realization of cosmic harmony straight to the unknowable Mystery. They become Silence.